A standard event listener allows you to listen for and respond to events that occur in the current application. 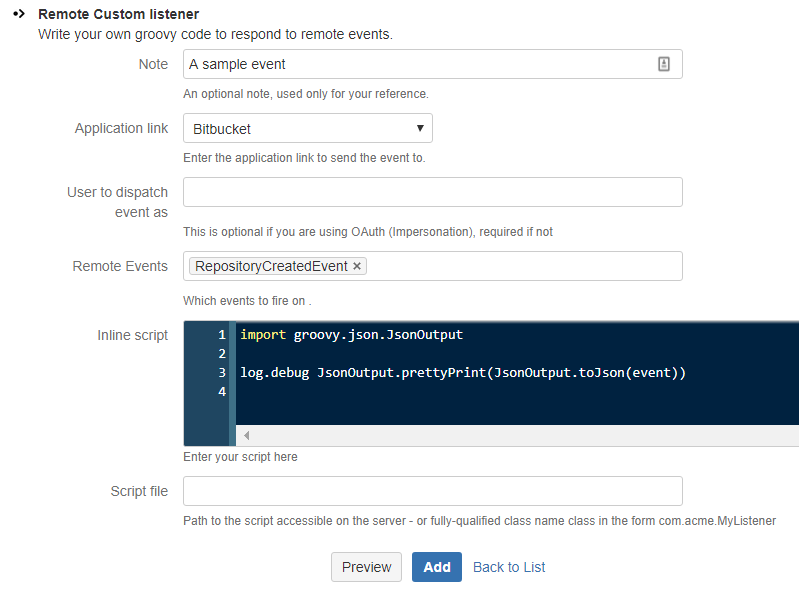 Remote events allow you to listen for events in a linked Bitbucket, JIRA or Confluence instance. Bamboo will be available soon. Provisioning - when a project is created in JIRA, create it also in Bitbucket and Confluence. When setting up a remote listener, you will select the linked application, then choose one or more events to handle. Under the covers, when the event is fired on the remote application, it will be serialised to JSON, then sent to the receiving instance. Upon arrival it’s republished as a local event and your listener will then respond to it. The code sample above is the following. It simply dumps the content of the event to the log. log.info "Remote event received: "
Note on app link configuration. If you have not configured OAuth (Impersonation), you may be prompted to authorize communication to the remote app in order to retrieve the list of events, on your behalf. Upon submitting the form, the remote app will contact the app you are working on, to verify it can send the event as the user that initiated the event. If you are not using OAuth (Impersonation), you should specify a user that will send the events. We discuss getting the actual user that initiated the event later. It’s a good idea to create a user called for example bot, that exists on each application. You can then configure remote events to be sent as this user. To test the handler, we will cause the event to be fired on the remote application, in this case by creating a new repository in Bitbucket. If you have specified a user, you can get the remote user name using event.actor.name. In this example we have two JIRA instances linked togther. We’ll assume that there is at least one like-named project on both instances. When the create version event arrives we will simply create a version in the same project on the local instance. Most of this code relates to the fact that we don’t receive the dates as a Date class, so we need to parse them out. Dumping the event map will show you exactly what you are getting. See the documentation on remote events for an alternative way of accomplishing this.